Although he seems pretty sure, he’s also leaving things open to speculation and interpretation. Plus it sounds like he might have been held back from being more explicitly LGBT in the movie. However, now Lando himself – or at least Donald Glover – has said he agrees with this interpretation of the character. Talking at a Solo town hall alongside co-stars Alden Ehrenreich, Emilia Clarke, and Paul Bettany due to air on SiriusXM’s Entertainment Weekly Radio (channel 105) on Thursday (and reported by EW), Glover even went as far as to suggest perhaps a lot of the Star Wars universe is pansexual. While occassionally a director is sidelined during the post-production period, it’s incredibly unusual for them to be ousted while filming is still going on. 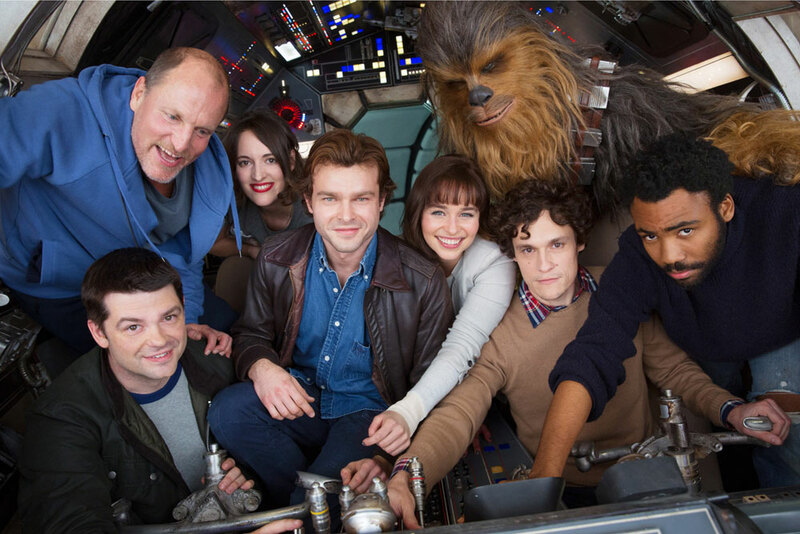 However, that’s what’s happened on the planned Han Solo spin-off movie, with Lucasfilm and helmer Phil Lord and Christopher Miller parting company with three weeks left on the production schedule. Reports suggest executives felt the directors weren’t hitting the right tone, and that the creative differences they’d had with Lord and Miller since early in pre-production just getting worse. It’s rumoured that the directors’ comedic, improvisational style made some concerned they didn’t really understand the character of Han Solo or the script they were working from, while the footage they were producing made it difficult to tell what the finished movie might be like. However, with production underway they’ve had to act quickly to plug the gap, with THR reporting that Ron Howard has come onboard to helm the movie. Howard was previously offered The Phantom Menace, but passed that opportunity up, but now the Da Vinci Code helmer will take over the Han Solo movie, finish principle shooting and then guide the film through its extensive post-production process. Lucasfilm will be hoping he can pull things together to their satisfaction. Production will resume on July 10th, once Howard has had a chance to familiarise himself with the project and see what he thinks it needs. Interestingly, it’s not known yet who will get the directors’ credit on the finished film. The Directors’ Guild usually only allows a single director, and is likely to be very unhappy about allowing three, even if that would seem the most sensible option. Some filming has already begun of Disney’s planned Star Wars movie based on what Han Solo was up to before the events of A New Hope, but it’s still adding to its cast. Variety reports that Westworld’s Thandie Newton is in talks for the movie, although not too surprisingly, there’s no info on what her character might be. Alden Ehrenreich is taking over from Harrison Ford in the main role, with Donald Glover, Woody Harrelson, Phoebe Waller-Bridge and Emilia Clarke also set to star. Harrelson will be Solo’s mentor, while Glover will be a young Lando Calrissian. However, it’s not known who the women will play. The Lego Movie and 21 Jump Street’s Phil Lord and Chris Miller are set to direct the movie, which is due out May 2018. Newton, who’s previously been seen is the likes of Crash, 2012, Mission: Impossible II, and The Pursuit Of Happyness, is just coming off her acclaimed role as a robot in Westworld. The HBO show earned her a Golden Globe nomination. The planned Han Solo spin-off film is really coming together with Alden Ehrenreich as the younger version of the character made famous by Harrison Ford, Donald Glover as Lando Calrissian, and Emilia Clarke as the female lead (the character’s name is yet to be released). Now another name may be close to signing, as Variety says that Woody Harrelson is in early talks for the movie. If he does end up in the movie, he will play a character described as a mentor to the young Han. As Harrelson has made a career out of playing laid back dudes, and more recently unlikely mentors in the likes of The Hunger Games and The Edge Of Seventeen, he seems a good choice to play someone who helped make Han Solo the man he was across four wildly popular movies. Lego Movie and 21 Jump Street helmers Phil Lord and Chris Miller are set to direct the movie. It’ll be in cinemas May 2018. The first of the Star Wars side movies, Rogue One, hits in December, but Disney/Lucafilm is already planning the next, which will be based on the early days of Han Solo. Alden Ehrenreich is set to play the main role, and now it’s been officially announced that Community’s Donald Glover will be the young Lando Calrissian. Disney CEO Bob Iger has previously described the film as being, “An origin story about Han Solo and Chewie.” However, Han also knew Lando when he was a young pilot, and it looks like the movie will also cover their relationship, although it’s now known exactly how the future Cloud City head will factor into the movie. The filmmakers are also currently looking for the movie’s female lead and expect to cast someone in the next few weeks. The movie will shoot early next year for release May 2018. 26-year-old Alden Ehrenreich has been the ‘next big thing’ for a while (in fact ever since he was discovered by Steven Spielberg entertaining at a bar mitzvah). However, the likes of Beautiful Creatures failed to really break him out, and while he’s gotten very close to numerous other major tentpole roles, they’ve ended up going to someone else. Now though, he’s landed a massive one, as it’s been revealed that he wiill play the young Han Solo in a planned standalone movie about the space jockey, set before the events of A New Hope. While the film isn’t expected to shoot until next year, it’s believed Lucasfilm wanted to cast him early, so they could include a cameo from him in this December’s Rogue One. Lawrence Kasdan and Jon Kasdan are writing the script for the Han Solo movie, with Phil Lord and Chris Miller set to direct. Ehrenreich has just come off an incredibly well received turn in the Coens’ Hail, Caesar!, which many commented would make a lot of people in Hollywood pay more attention to him. It certainly seems to have done that, although the young actor will also be aware that he’s got some very big boots to fill, taking over from Harrison Ford.